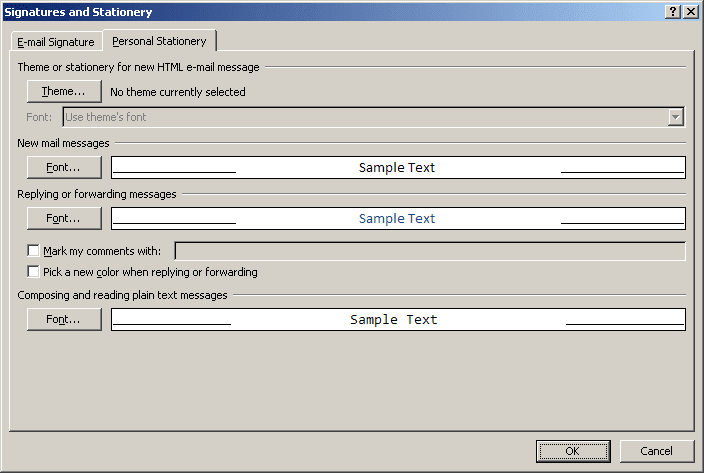 One such setting that became necessary very recently was the need to standardize on a common Outlook email experience. After years of dealing with inconsistencies in how emails looked from different users, our company decided to enforce a specific typeface, font size, and color for every corporate email. For create new one.... Click file > options > mail, now under compose click stationary and fonts, here personal stationary tab where New mail message> click font. You will reach Font main dialog, start changing basic font settings; from Font select the font family, under Font style, choose desired style and from Size change the size of font. You can see all the changes in Preview pane.